Jeremy Epstein always knew he wanted to work in the art world. "It was in my mind from an early age," says the 28-year-old, who had a part-time job at Tate Modern as a schoolboy then studied for a Masters at the Courtauld Institute before starting his career as a gallerist. That's the term now widely used to describe entrepreneurs who represent artists as agents, stage exhibitions of their work in their "spaces", and nurture their talent as attentively as if they were coaching footballers for the Premier League. As co-director of Edel Assanti, one of London's most hotly tipped dealers in contemporary art, Epstein is one of the younger generation of gallerists helping to make the city's art scene swing. And this is the biggest week in their calendar, as artists, dealers and collectors fly into the capital - which now vies with New York as the centre of the art market - to attend Frieze, the 11th edition of the annual art fair in Regent's Park at which works by Old Masters, established artists and cutting-edge names are on sale. With this event in mind, the timing seemed right to quiz the stars of this new generation of gallerists to find out what makes them tick. In many ways, their working methods would be recognisable to Daniel Kahnweiler, the astute Paris dealer who spotted the Cubist paintings of Picasso and Braque more than 100 years ago, created an aura of desirability around them and made both his own name and those of his artists in the process. "It never ceases to surprise me," says Melanie Gerlis, art-market editor for the Art Newspaper, "how little has changed in that time." The basic requirements remain the same: you need art and you need a space from which to sell it. There are plenty of budding Damien Hirsts to supply the former, although it's clearly a skill to spot such a prodigy; as for the latter, "You can do it from your front-room," points out Rebecca May Marston of Limoncello gallery. Indeed, Hannah Barry, the most high-profile of the young generation of London dealers, started by staging shows in a Peckham squat. The business arrangement between artist and dealer is also little changed. Most representation is sealed on a handshake and, although k the details of such agreements are rarely revealed, Gerlis says a 50/50 split on the selling price "is the usual rule of thumb". But there the similarities end. Whereas in the past dealers were often salesmen with an eye on the main chance, today's young gallerists have been immersed in the world of art from an early age. All of the people interviewed for this piece have a training in art history; one - May Marston - took a postgraduate course in curating; and two - Epstein and Phillida Reid - worked in blue-chip galleries before they set up. This is the first generation for whom being a gallerist is a profession. This is also the first generation of gallerists to have grown up in the age of the art fair. These commercial behemoths now take place annually in practically every major world city, with key events in Hong Kong, Miami, New York, Basel and London. And it is these fairs which threaten the future of the gallery as we know it: if dealers can simply travel from fair to fair and sell their wares, the argument goes, who needs the headache or overheads of running a permanent exhibition space? However, the majority of the gallerists we spoke to are adamant that the fair can never replace the role of the gallery because, as Epstein puts it, "The gallery is where the risk-taking still happens." And here lies the crux. It is the intangible nature of the product that sets the art market apart from every other trade. What gallerists are cultivating is that magical process by which artists express the human condition through visual representation. It's hard to put a value on that: £1,000 or £10m a piece? There's no clear answer. But what is certain is that all the gallerists on these pages see the future of their role as creative as much as commercial. "One hundred per cent," says Barry. "Otherwise I may as well just be selling soap." 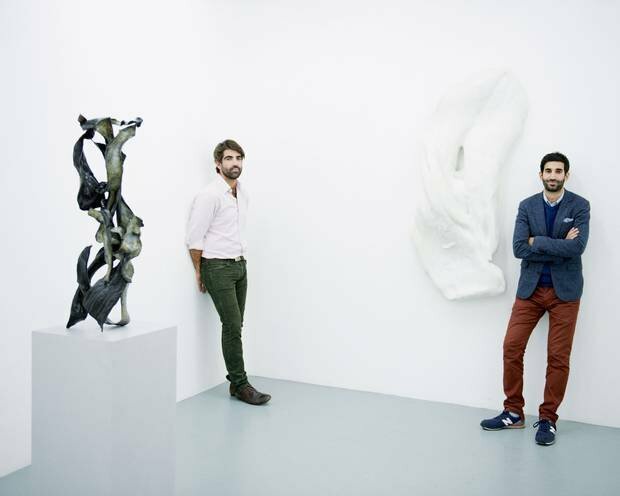 The 28-year-old Epstein worked at the blue-chip Gagosian gallery before setting up Edel Assanti with co-director Charlie Fellowes, 30, in 2010. "When Charlie and I started in 2009, we both had full-time jobs and we were doing pop-up shows in buildings that were empty because of the [financial] crash. They were mostly group shows, which gave us exposure to lots of the artists we work with today," says Epstein. "Charlie and I both worked for top-end galleries and had it drummed into us how the business works, so after the pop-ups, we transformed into a gallery which follows the classical model: representing artists, showing their work and selling." "When people say that the gallery is dead, I couldn't be further from that viewpoint: it is the place where artists can do whatever they want, no holds barred. Art fairs are one of the biggest game-changers in the past five years, but they are different animals: a fair is where dealers come to sell and collectors come to collect." "Our gallery is in Victoria, which makes it this intriguing entity: it's neither an East End gallery nor a Mayfair gallery. It was previously a post-room; we bulldozed a few walls and now it's this amazing, open, industrial space." "We're proud of our broad client base. Some of the most established collectors in the world come through our doors, but that doesn't happen without a lot of effort. At the same time, we have an amazing group of young collectors who have supported the gallery from day one and without them it would never have kicked off."